The Justice LJ4 Series Open Hopper Progressive Cavity Pump represents an ideal pumping solution for viscous solutions with high solids contents such as high-viscosity chemical transfer of liquids and sludge’s in industrial facilities and other low-flowable pumping mediums. The Justice Series offers a design of a heavy-duty auger mated to a rotor and stator for the most difficult pumping applications available today. Flow rates of 2.02 GPM per 100 Revolutions (5 GPM to 9 GPM) at up to 225 PSI are standard through the range of the series. The large feed-hopper design easily accommodates your pumping medium while the non-pulsating design of the product produces a low-shear flow that conveys your medium along effortlessly. Solids in suspension of up to 50% are accommodated by the Auger design. 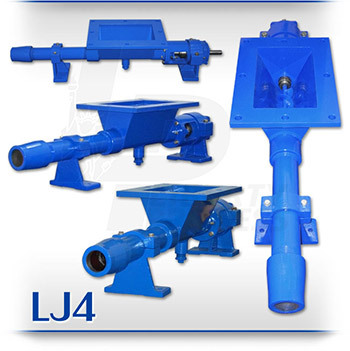 The modular design of the LJ4 Justice Series Open-Hopper progressive cavity pump is a hardened pinned-joint drive assembly with a body available in steel or 316 stainless steel and internal wetted components in either stainless steel or hardened tool steel with hard chrome plating for long-life and durability in abrasive pumping applications. Rotors and Stators for the LJ4 Justice Series are available in 1, 2, and 3 stages for applications with 75, 150, and 225 PSI discharge pressures with stators available in Buna Nitrile, Viton, EPDM and Natural Rubber. The standard seal design is a set of packing with a lantern ring and flush connections. Mechanical Seal options are readily available.